The Deer Aversion Program will come to an end as of April 30, 2019. In an effort to prevent undesirable human and mule deer interactions within the town of Pincher Creek, Eagle Creek Wildlife Control has been contracted to reduce the number of mule deer currently present in the Town of Pincher Creek. Mule deer have caused untenable damage to numerous properties in the town, have presented a traffic hazard during road crossing, have attacked and harmed pets and present a danger to humans, especially during the fawning season and particularly to the elderly and young. Wildlife habitat directly adjacent to Pincher Creek is suitable for sustaining a healthy number of mule deer; however, as the town provides a comfortable habitat where there are few obstacles to free movement, unsuitable but edible vegetation, a lack of natural predators and even man-made provided sustenance, a sustained effort will be required to create a deer-free environment in Pincher Creek. A trained field technician in easily identifiable company uniform, accompanied by a trained dog on a secure lead will be dispatched into areas of the town where deer frequent or have been recently sighted. 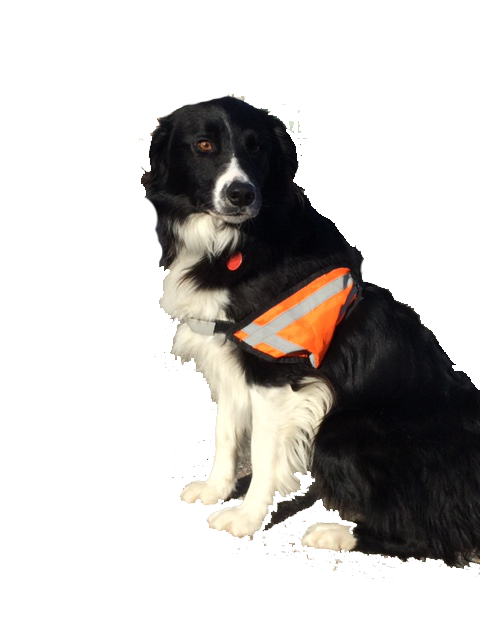 The technician and dog will wear high-visibility service vests. The dog’s vest will be saturated with predator scent to increase its stressing potential. In addition to this gentle stressing program, and in situations where deer prove to be too difficult to stress from a safe distance, noise makers may also be employed to heighten deer anxiety. These noise makers will consist of ‘bear bangers’, a safe-to-use pyrotechnical device that when deployed creates a loud noise designed to startle but not harm the deer. Several ‘hot spots’ in town have been identified and will be actioned as priority areas. Residents can report deer sightings by going to www.pinchercreek.ca/request and putting in a request under the category “deer”. Residents can print off this sign and place it in their front window to identify that the deer aversion technician has been granted access to the yard. Signs are also available for pick up at the Town Office and Swimming Pool. 1) Eliminate deer attractants. If you have a vegetable garden or fruit trees, harvest produce as soon as it is ready. This will prevent deer from seeing (or smelling) something tasty and deciding your yard is an all-you-can-eat buffet. Please do not leave or put out hay or other feed for the deer. 2) Maintain your landscape. Don’t make your yard a cozy place for visiting deer. You don’t want to tempt them into bedding down for the night or resting there in the day. Trim densely planted areas to make them seem less appealing as hiding places. Deer prefer areas that offer quick cover in the case of predators, so eliminating that cover will discourage deer from hanging out in your yard. 3) Let your dog spend plenty of time in the yard. Chances are if your dog spots a deer, it will bark. The deer will run and may eventually decide your yard isn’t a safe place to graze. 4) Make your property as inaccessible as possible. Please keep gates closed and fences in good repair. The harder it is for deer to access your property, the fewer problems you will have with deer or other problem wildlife. Pictured below Jedd and Zena, Wildlife Control Team members.